The LA Times had an article exploring the menu planning for a multi-year space trip- complete with a terrarium-hydroponic system for growing greens. The goal is a sustainable and lightweight food supply for trips to Mars in the next few decades. While people can survive on canned mac and cheese and freeze dried pork chops I bet some nice crunchy lettuce would be a welcome snack up in space. In the meantime, scientists are weighing the pros and cons of supplementing packaged meals with fresh fruits and vegetables. 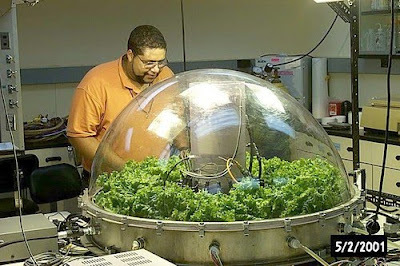 NASA first grew plants in space in the 1960s, and a team at Kennedy Space Center in Florida has been developing a domed chamber in which astronauts could raise crops like lettuce, tomatoes, carrots and green onions hydroponically. "That would really add to the quality of life and acceptability of the diet," said Ray Wheeler, the plant physiologist in charge of the project.